The next informal meeting of RAST will be at Sena Place Hotel on Sunday, June 4, 2006 from 11 a.m. onwards when a buffet lunch will be served and President Chaiyong Wongwuticomjon, HS1QVD, and RAST Secretary Phattanadit, HS1WFK, will provide an update on developments. All members, their guests and any hams who are visiting Thailand are welcome to attend the meeting. Monthly meetings provide an opportunity for RAST members to meet one another. Incoming QSL cards are available and outgoing cards are collected by the manager, while officers of the RAST committee brief members on past, present and future developments and activities. RAST members who attending the May 7, 2006 meeting were expected to be briefed about developments in amateur radio, when there was to be a report about a meeting and hearing of the National Telecommunications Commission conducted on Sunday, April 30. RAST Secretary Phat, HS1WFK, was to brief members about that meeting and any new developments, including the NTC's proposed band plan that includes allocations on the low bands (80 and 160) as well as the WARC bands (10, 18 and 24MHz). Awards for the 2005 IARU Radiochampionships were also to be presented at the meeting along with plans to organise a major ``hamfest'' to commemorate His Majesty the King's 60th anniversary of accession to the throne in June this year that were expected to be announced. There are also plans to seek the special callsign HS60A. Khun Phat was also to speak about RAST's initiatives and the main points in its proposal to the NTC. These include seeking permission to operate on 50-MHz (the 6-meter band), to use the 10GHz UHF band, including for novices, and to seek a clarification as to when we will be able to operate on the WARC bands, asking for an expansion of the 7-MHz band, and making a request to follow European and Japanese standard practices in transceiver specifications as well as to ask about the possibility of new licence classes. RAST has also asked the NTC that the priority of amateur radio be raised in the national frequency bandplan and is seeking that a RAST committee member be present on all NTC sub-committees concerning amateur radio. It is also seeking new licence classes and a relaxation of power limitations and proposes that the net control stations be allowed to operate on a volunteer basis. RAST will raise funds to be able to establish a permanent office, strive to improve the quality of its work and recognises the importance of the society's acceptance by the National Telecommunications Commission (NTC) and other government agencies as well as by other clubs and societies across the country. RAST also intends to set up the Thailand Amateur Radio Emergency Service (TARES) this year. These were among the pledges made at the April 2, 2006 meeting made to members by incoming President Chaiyong, HS1QVD, and Secretary General Phatanadit, HS1WFK. The new committee, whose line-up was announced in detail, is also committed to making RAST capable of being a centre of knowledge and technology in IT and communications for hams and interested members of the public in RF, satellite and IP communications as well as TARES, they explained. Another objective is to create new radio hams in Thailand and to extend knowledge to the public. One of the first issues on the RAST's agenda will be to prepare a draft new regulations for amateur radio for submission to the NTC, which it was explained needed to be done in the next couple of weeks before the NTC presents its own plan, which would be followed by a public hearing. In charge of drafting this is Kanchit, HS1JC, who is now gathering ideas from members, and a call went out for members to submit their ideas to him. (Kanchit's email address is HS1JC(AT)sc.chula.ac.th). During the meeting, Brian, HS0ZEN, observed that we needed to ensure that the proposals should comply with international regulations. Newly-appointed station manager Finn, OZ1HET, gave members an update on the status of the HS0AC club station at the Asian Institute of Technology, where he reviewed the status of working equipment. The main rig, the FT1000, is undergoing repairs, and other transceivers need attention. He said he would be the Administrative station manager whilst Winit, HS1CKC, would help as technology assistant station manager. The objectives would be to have two working HF positions and two standby positions, he explained. 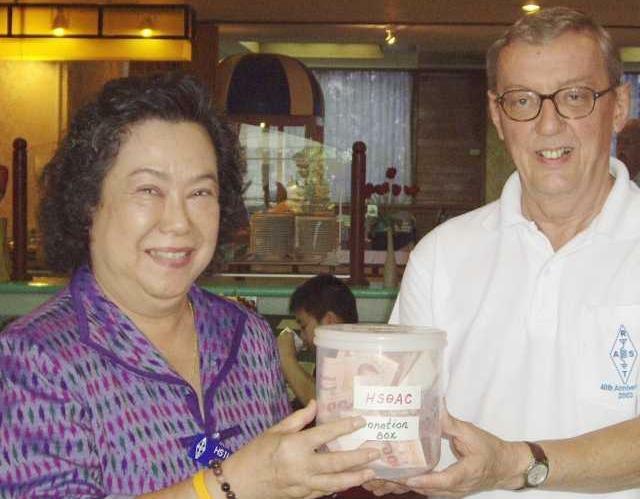 Towards this, Finn asked for donations from those present and a box was passed around, raising over a thousand baht towards improvements at HS0AC. Some equipment was redundant and will be given away to members this coming Wednesday evening (April 5) when Finn will open the station to visiting members from 4 p.m. onwards. All members are welcome to attend. Swen, HS0ZFZ, would take care of QSL cards for the club's operations, Finn added. Meanwhile, plumbing problems and wall cracks had been reported to AIT's caretaker for attention. John, HS1CHB, updated members on RAST's plans to seek permanent permission from the NTC to operate on the low-bands, 160 and 80 metres, which have been authorised for contest operations only for five years now, as well as for the WARC bands. After a question from Champ, E21EIC, asking if RAST would seek a special event callsign HS60A to commemorate the 60th anniversary of His Majesty's accession to the throne this year, it was agreed that John would initiate a RAST request for this. Champ also mentioned that there would be a micro-DXpedition to Vientiane later this month, from April 12-16 to operate HF and satellite using the callsign XW1Z. This is during the Songkran (Thai New Year) festive season, when another group of Thai DXers plan to operate with the callsign HS7UCQ from the Kaeng Krajan Dam in Phetchaburi Province from April 13-15. The April meeting adjourned at about 2 p.m.